Let’s face it. Pennies have become pretty much useless as currency. Banks don’t seem to have much interest in them, it isn’t even worth the effort to pick one up off of the ground, and I’m not so sure that throwing one in a fountain has ever really brought me luck. Pennies may have fallen out of favor with the money-spending set, but they are actually enjoying a rebirth, counting many crazy ideas among their current uses—everything from fuse replacements to curtain straighteners to tread checkers for tires. But how about a floor covering? 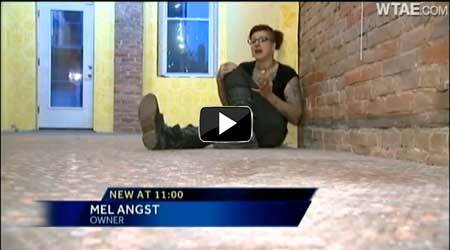 While engaged in my daily dredge of Yahoo News, I was beyond surprised to see my old friend Mel Angst, of Pittsburgh, garnering national attention for her latest offbeat accomplishment: tiling the floor of a commercial building with—you guessed it—pennies, 250,000 of them, to be almost exact. 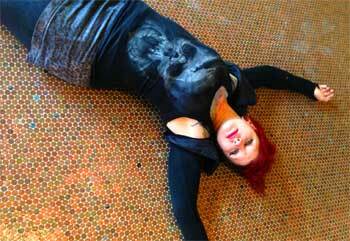 Mel Angst and her penny floor. The project didn’t strike me as particularly mind-boggling until I looked at my own floor and imagined how little space a penny actually occupies, and how many of them one would need to meticulously lay, to cover even one square foot. Instant headache. Better her than me! Mel and her husband, Jason, purchased their three-story, Victorian-era structure about a year and a half ago. She describes its condition then as “post-apocalyptic.” Today, with a tenant on the third floor and a thriving tattoo business on the second, they are customizing the first floor as a gallery/café/tattoo waiting area. Having seen a penny floor in a bathroom online, Mel adopted the idea in hopes of setting their space apart. Reinforcing the existing wood subfloor came first with the installation of PermaBase cement board. Then they leveled with a liquid floor leveler and began the arduous process of adhering the pennies with Loctite PL Premium 3x polyurethane construction adhesive; eventually, they grouted with an unsanded grout. Crazy as it sounds, the floor comes out to about $3 a square foot, or 300 cents a square foot, depending on how you look at it. The penny floor is hiding surprises—dimes, pesos, and more. When we were talking, I looked down and, lo and behold, spotted a few dimes. Mel pointed out that when you get pennies in bulk, even from the bank (that said her request to turn $2,500 into pennies was the strangest they’d ever received), you get a lot more than just pennies, prompting her to learn a lot of penny fun facts. “There were pesos in the floor, coins from India, coins from China, even a Civil War coin, and 1940s steel pennies,” she said. “There are gold pennies from science experiments, pennies from the Bahamas have a starfish on them, and pennies from Barbados have a trident.” They even found a metal Holiday Inn token. Adhering a bazillion (or thereabouts) pennies is an overwhelming job, but Mel and Jason had help. Volunteers were plentiful and, as thanks, were offered $10 off of tattoos. Anyone logging 30 or more hours on the floor was offered a free Abraham Lincoln tattoo. How fitting. “All these people really bonded over the penny floor,” she said. 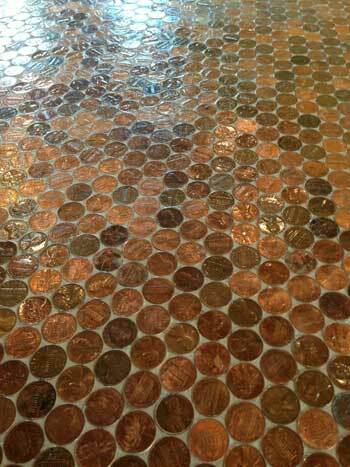 Variations in penny colors give the floor a mosaic look. The most people gluing at one time was about seven, but on average, it was three to four people a day, for 10 to 16 hours a day—for weeks. Unfortunately, however, too many cooks in the kitchen breeds inconsistency in application, and some areas didn’t adhere all that well. After everything appeared to look good, the couple hosted an art opening in the space. Hundreds of people attended, kicking up pennies that were loose. Mel and Jason were actually hoping for that—it was an easy way to tell right off which spots needed attention—but what they found were larger, distinct patches that needed redoing. Hence, Mel spent the next month removing and reattaching. The floor was finished with traditional floor wax and, I must say, it was gleaming when I visited, having been totally complete (by Mel’s assessment) for only two days. After having repaired so many areas, they opted not to apply a super-strong topcoat for fear of having to strip the entire floor to address any future troublesome spots. 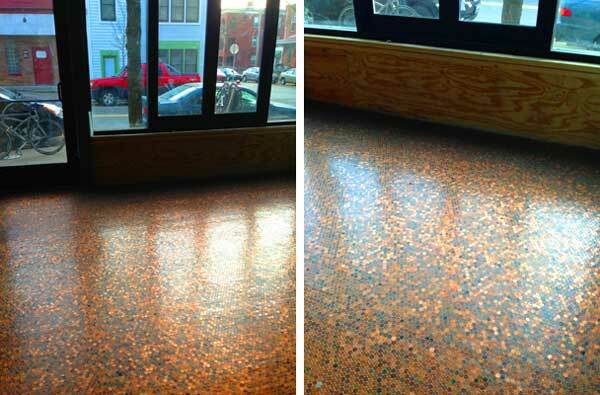 Penny surfaces are popping up everywhere, in restaurants and cafes, retail spaces and residential bathrooms. The Paul Smith Boutique in Paris (left) boasts penny walls, while Shop Adorn in Portland has a beautiful penny cash wrap counter. See more penny coverings here. Mel has certainly enjoyed her 15 minutes of fame and then some. Her penny floor video has gone viral, and the story has appeared on sites like huffingtonpost.com (in the Money section no less!) and abcnews.com, to name a few. Just Google “Mel Angst pennies” to see the breadth of coverage this story received. But Mel takes the attention in stride. “On Election Day, the story was featured on NPR! It was stupid, I mean, it’s not news,” she says, respectful of what was news on Nov. 6. What she does appreciate, however, is how the floor has served as a catalyst for human interaction. Many people came by to donate pennies (after all, what else do you do with them?). “People stop by early in the morning to see it,” she says. “We’ve gotten tattoo appointments from it like crazy.” The previously mentioned art show was a photography exhibit of somewhat risqué work, but because of the floor’s notoriety, the opening attracted many local coin collectors as well as art lovers. Nice job, Mel and interesting blog, Pamela. I have a local bike shop that did the same to their counters and the effect can be quite striking. Personally, I can't see me doing something similar...I'm too involved with a local charity that would welcome the spare change...but it is quite the concept. What a great idea and really, quite a nice look!